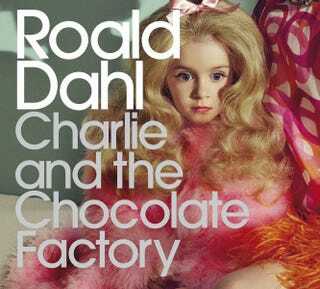 To celebrate the 50th Anniversary of Charlie and the Chocolate Factory, Penguin decided to create a new cover for the Roald Dahl work. What resulted was both confusing and terrifying. Run, kids, run. This new image for Charlie and the Chocolate Factory looks at the children at the centre of the story, and highlights the way Roald Dahl's writing manages to embrace both the light and the dark aspects of life, ready for Charlie's debut amongst the adult titles in the Penguin Modern Classics series. One thing is for certain: when I look at this cover, I think Chocolate Factory.